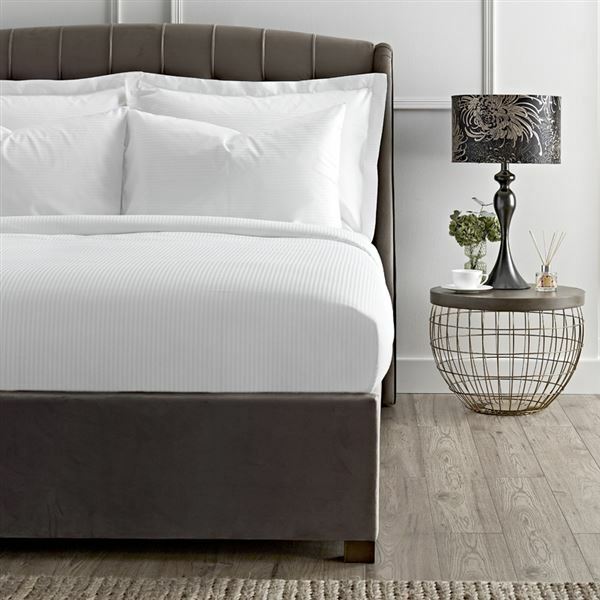 This 300 thread count micro stripe bed linen has the luxurious look and feel of Egyptian cotton but because the long staple yarn comes from another source, we can’t call them Egyptian. This superior 300 thread count cotton percale has a 0.5cm micro stripe and is a favourite with laundries because it retains its quality and feel after hundreds of washes. All items are oversized because some shrinkage will occur in the first wash. The standard duvet covers are closed with strong and durable stainless steel poppers. The bag style duvet covers are 20cm longer and have an open bottom end that tucks under the mattress. second order of this bedding. Gives a lovely, fresh, welcoming finish to the bedrooms. We use the housewife at the back and the Oxford to the front for a luxurious, welcoming finish to our beds. Longer quilts so it gives that lovely tucked in finished look and no press-studs to fasten. It looks luxurious. Quite a nice silky feel. Worth it. I’ve used this bedding in my holiday let for many years, quality of fabric is excellent, good value for money and washes like new year after year. Superb quality. Easy to iron. Washes well, looks good, irons well too.. what more can one ask? Always wash new bedding, looks rather large for a double but will see when I use it. Very pleased with the quality and finish. Given these 5 stars as same quality and finish as quilt. Think I might have ordered the wrong size as so very large - my fault. Oversized and didn't shrink on washing at 40c as recommended. This is the best bedlinen. Purchased a few years ago and still like new, it washes and irons really well. My guests often comment how lovely it is. White micro stripe sheets. Excellent quality and love the fact that size or colour labels are inside so that sizes are easily recognisable! An excellent product we are very happy with and I'm sure we'll now buy more. Brilliant! All I could ask for, washed and ironed like a dream and no more buttons to loose or ping off when going through the roller iron.I am certain they will give years of wear. Beautiful fabric, well made, by far the best I've used including White Co. Definitely recommend. Very impressed with the look and feel of this bedding. And it launders beautifully. product good buy service not. Ordered 4 of these, out of stock, waited for about 3 weeks. Don't allow orders for out of stock products. Not the first time this has happened. I bought a set a year ago and at first I wasn't impressed with the feel of this bedding. However over time my impression has changed. After a years worth of use and washing the cotton is becoming increasingly soft and luxuriant. But what's impressing me even more is how the fabric is holding it's bright white colour and how robust and easy to use the steel poppers are. Much better than buttons which all fall off. Will definitely buy this as my old linen wears out. Arrived with poor stitching and it was stained. Not impressed. This is the second year that I have bought this product. I have been so pleased with it that I want to gradually replace all my bed linen with this product. Very very good quality. Good firm poppers, and irons well. Really pleased with it. I shall be changing over all my beds to this lovely duvet cover. I am delighted with the quality and feel of this bedding. It remains crisp and fresh after laundering and the duvet covers and pillow cases remain 'square' - no wobbly edges/seams. It irons up well and reasonably easily, but perhaps that is because I have the time to hang my laundry out rather than using a dryer. Like the metal studs too - very practical. Very pleased all round, the best I've purchased from anywhere so far. Will certainly be buying more. I love this bed linen and so do my guests. It's not the easiest to iron but with a little starch - we make our own, it's fine and the finish is great. I've just order more! This bedding is made to a high quality standard and feels and looks just beautiful. I iron by hand with a steam generator iron,and find this bedding easy to iron, especially now after a few washes. The bedding is stunning and is exceptional value. It gives a lovely crisp fresh look. The poppers are also great - easy to open and close quickly. I would highly recommend this bedding to anyone. Nice quality crisp cotton. Though rather more difficult to iron than other 100% cotton covers I have. I iron by hand not rotary iron!